foobar2000 is awesome; so is Last.fm. Let's open your media player to an infinite library of new tracks. Once the component is installed you don't have to do anything. The tracks are scrobbled through the Last.fm client, which needs to be running (an allows you to see artist info, send feedback.... and to turn of scrobbling easily). It works perfectly for me, apparently some people report crashes. -One is "standalone" and does not need the Last.fm software. This one doesn't seem to work for me at the moment. Apparently it enables iPod scrobbling (with foo_dop)! Can be found here. 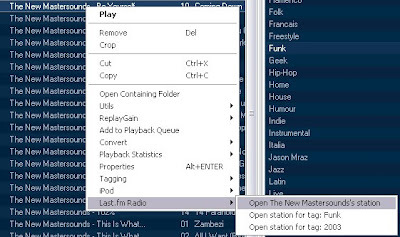 Once the component is installed, go to Menu>File>Open Last.fm Radio Station, and click the only option available. Then enter your username and password. -In the context menu of the TRACKS (anywhere in foobar2000), there is a Last.fm radio element. It allows to play the artist's radio, the tag radio based on its genre, and the year's tag radio. Once you select a radio, a list of songs appear in the playlist view. Double-click on the first one to start streaming. The list should refresh automatically. NB: This component does NOT scrobble the tracks. If you want to scrobble them, you have to use both components. Just added it to my set-up, works perfectly!